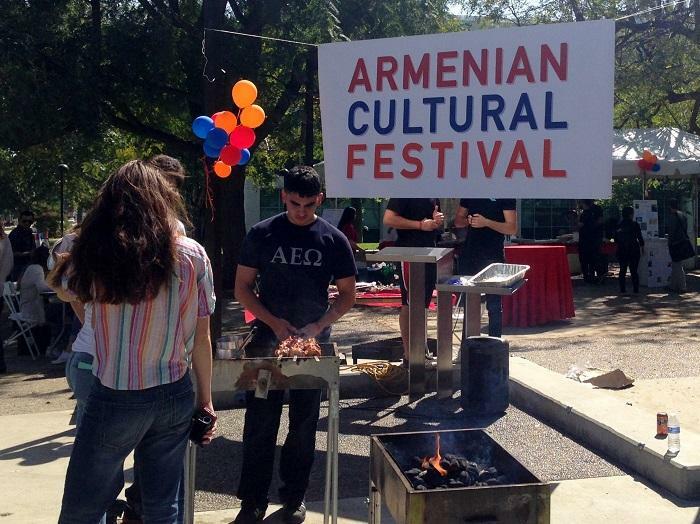 The Armenian Student Association (ASA) gathered at Matador Square to bring awareness to Armenian culture with their annual Armenian Cultural Festival on Thursday. Loud speakers blast cultural Armenian music as smoke erupts from over the bbq pit, cooking beef and chicken shish kabobs. Members of the organization gather around together to sell freshly made Armenian coffee and locally donated Armenian pastries. 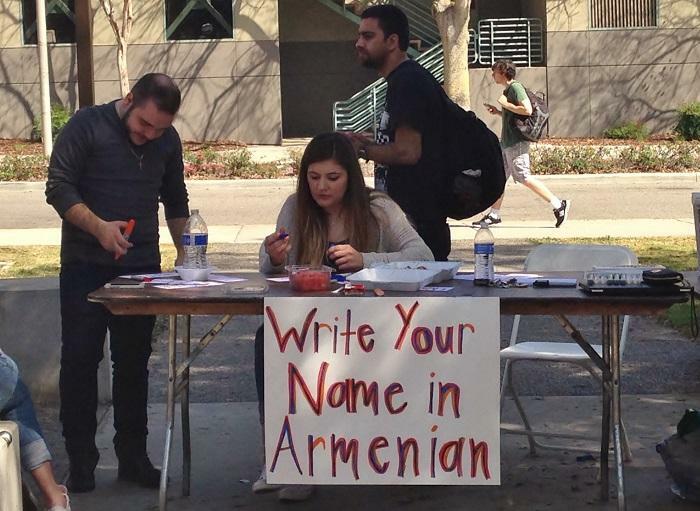 An Armenian Student Association (ASA) member’s handmade jewelry was sold from $5 to $25, with all proceeds being donated to an orphanage in Armenia, while one of the girls at the table wrote student’s names in the historic language for free. Several other members of the Armenian fraternity, Alpha Episilon Omega, and other organizations involved with Armenia and its history was there for informative purposes to on-goers who are interested in learning about the Armenian cultural and history. “We want to show people what our culture is all about,” said Anna Chalikyan, all-ASA representative. The organization was started back in 1976, growing and catering to the largest population of Armenians outside of the country, said Christine Dashdemirians, ASA president. Of the 40,000 students CSUN caters to, about 10 percent are Armenian; larger than at UCLA or USC, which attracts a lot of people to CSUN, said Dashdemirians. As one of the most active ASAs, the organization serves as bonding mechanism for all Armenian students to connect with and understand their culture and people by holding weekly activities such as bowling, said Dashdemirians. ASA connects through local organizations as well, such as Hyer United, who was present at the festival. Hyer United is a non-profit organization that caters to Artsakh, a country that borders Armenia, said Dashdemirians. ASA has been very public and tried their best to bring awareness to their culture and the 1915 genocide. With all their effort and activity on campus, they have been noticed. Off campus, the L.A. council gathered on Wednesday and approved a motion to designate the intersection of Hollywood Boulevard and Western Avenue for what will be known as the Armenian Genocide Memorial Square. ASA just passed a resolution through Associated Students a couple weeks ago to commemorate the 100th anniversary of the genocide. All the ASA members and Armenian students are coming together to make a difference and spread the word. Dashdemirians said that CSUN has a great Armenian studies program and that ASA is doing everything they can to get people involved and to understand the culture and history of the Armenian people. For the 100 year anniversary of the genocide, which will take place on April 24, the organization will be holding a week-long art gallery of the CSUN community’s artwork in the Mike Curb College of Art, Media in the west wing said Dashdemirians. The gallery will run from April 23 at 7:00 p.m. and will be closed on April 24 in remembrance of the genocide, and will continue from April 25-29.